After our day of rest it was time to prove our preparation had not gone to waste. We left our accommodation at 6am via a baguette and croissant stop to drive to the start of the stage in Digne. The sign in stage in Digne for the start of Stage 18. Many may wonder when arriving at your viewing spot for the day, how one can make the time pass. Well, there is THE CARAVAN. 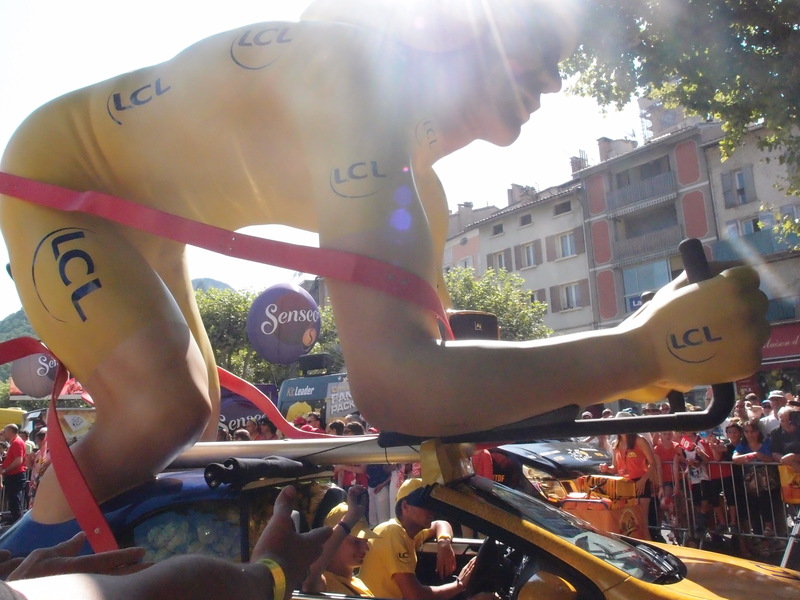 Each year, Le Tour sports official sponsors that on our TV screens we see on the side of cars, sponsoring mountain climb summits, the polkadot and green jerseys as well as the finish lines of each stage. All in all, there are a huge number of sponsors from technical partners Kawasaki motorcycles and Skoda to official suppliers like IBIS hotels, Carriefour and Vittel. Altogether there are 38 official sponsors including French TV 2 and 3 plus French radio. 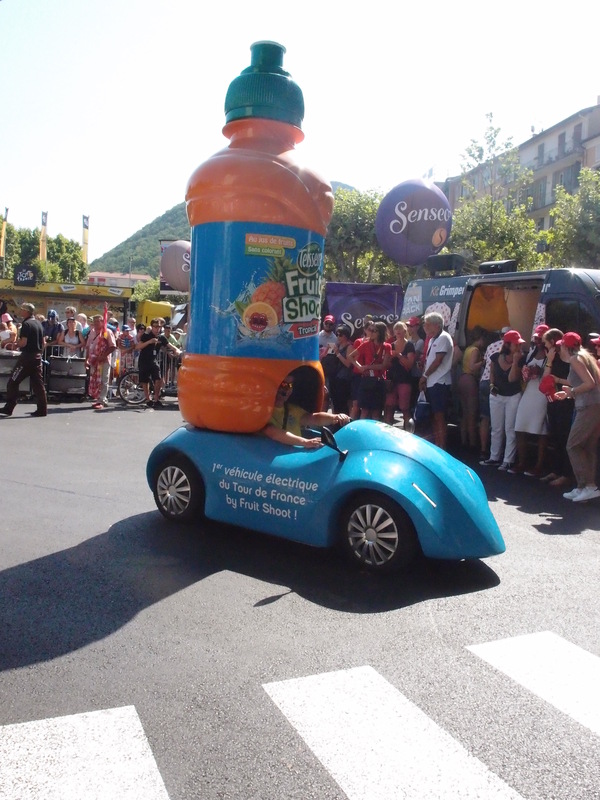 All have a presence in the caravan; a parade of trucks, floats, cars and vans decorated to do as much promotion of their brand or key product/s as possible. For four hours, two hours before the riders come through the course, the caravan winds its way around the course throwing free merchandise to supporters on the side of the road. With loud music blaring from the vehicles, loud speakers yelling encouraging information about their brand and people literally harnessed onto the back of a truck, they throw hats, water, lollies, key rings, bags, tattoos, wrist bands, cake, bread, aprons, blow up pillows, chicken wings, washing detergent and more into the crowds. The crowds love this (I saw a boy and girl fight over a t-shirt and an old lady steal a hat off another man). And better yet, when the riders come past some hours later, spectators are wearing their new hats, t-shirts, waving flags and bags thus, more promotion. 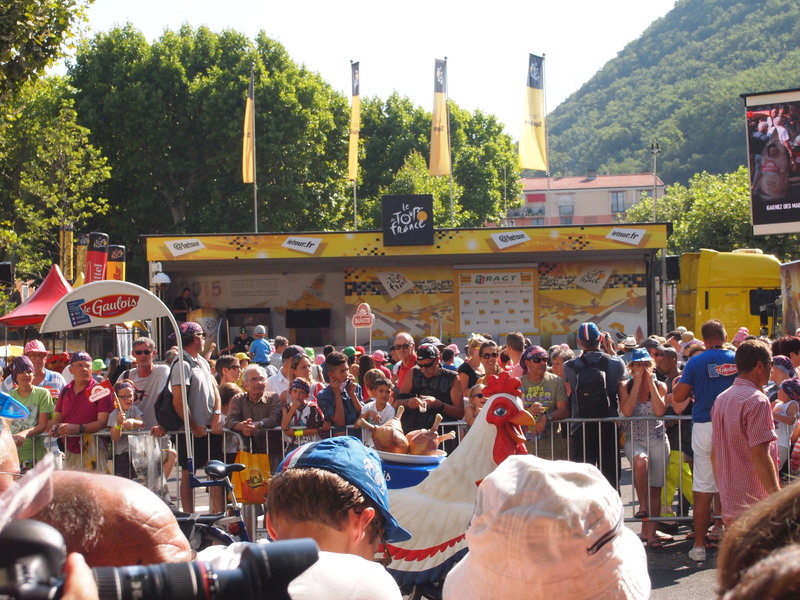 Being at the start of the stage, the caravan sets off after a number of hours entertaining the spectators in Digne, with tents and merchandise kiosks available to buy their products. 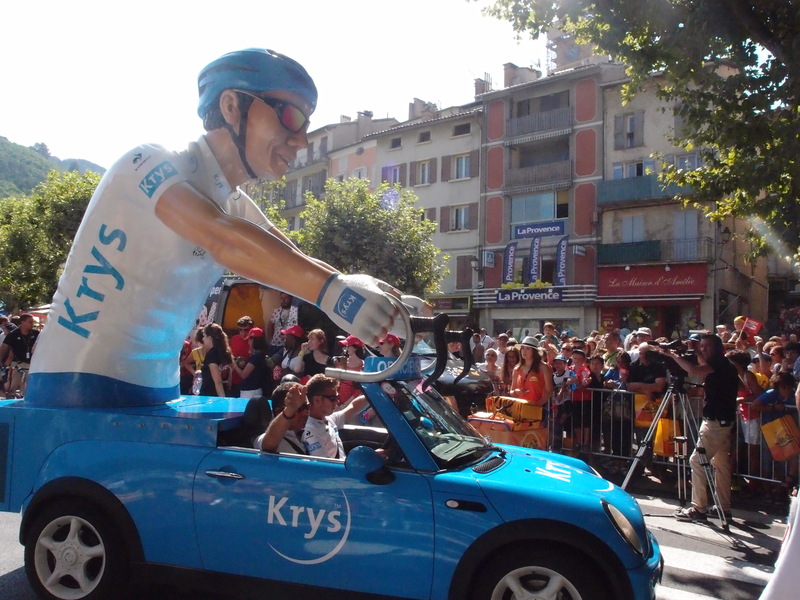 A larger-than-life Kyrs sponsor car… Apparently they are a glasses company but who would know? Just one of the crafty cars that is part of the Caravan. Yes, this ‘car’ drove the entire race. 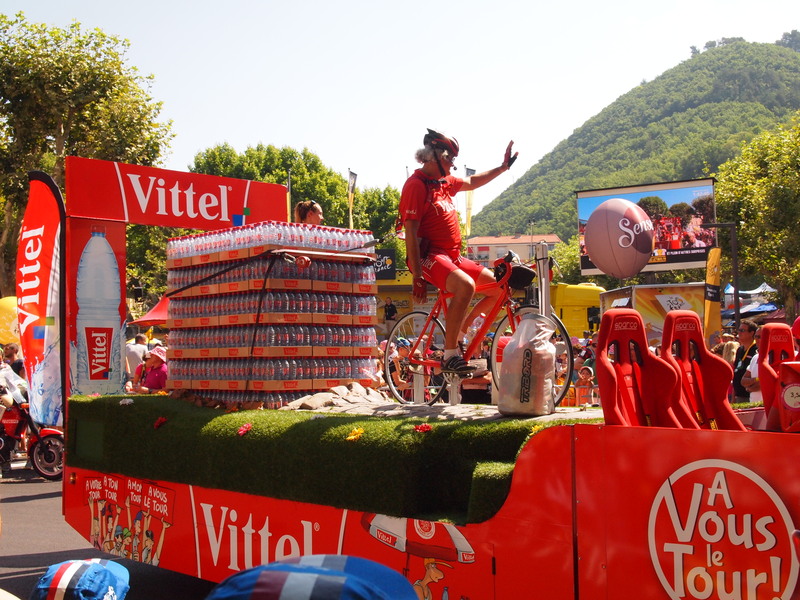 The Vittel brigade was about 15 cars, trucks and floats long and was a pleasant welcome on the days reaching over 32 degrees where water guns spray refreshing Vittel from the top of their trucks. After the hoopla of the pre race entertainment we back tracked significantly to get to the toll road highway, making it through part of the course before the road closed 2 hours before the race was scheduled to come through. 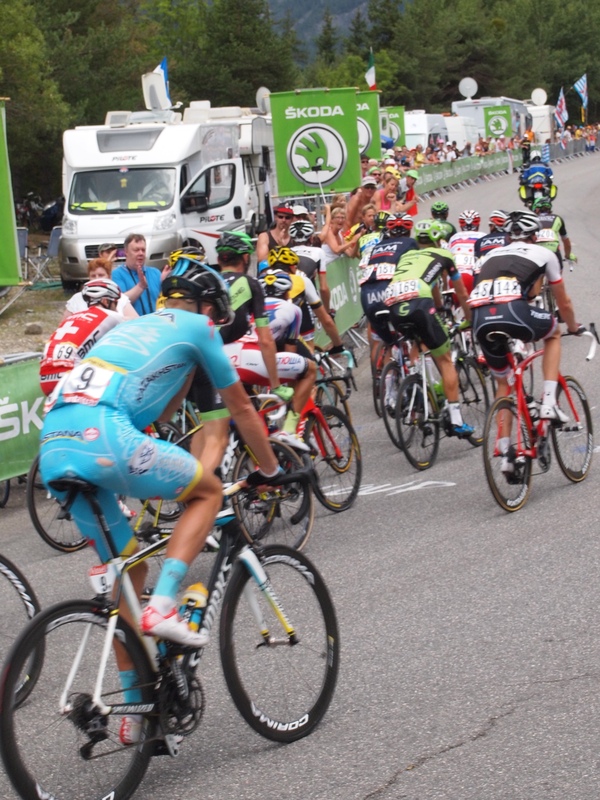 We were aiming for a spot at the base of the Pra Loup mountain climb, five kilometres from the end of the stage. We parked in the town of Barcelonnette and walked up the mountain a few kilometres away. We made it, scaling mountains and hitting very high speeds on the motorway. The riders were tired, we were tired and the thunderstorms were closing in. The views of the valley below were epic and the support from Norwegian corner where we’d inevitably found ourselves was full of spirit and lethargy having waiting on the mountain all day. Unlike our first stage, the riders came through in drips-and-drabs a few minutes apart over half an hour with the SAG wagon trailing the pack after a long day on the hills. Richie Porte and Alberto Contador chit chat before the day’s stage. 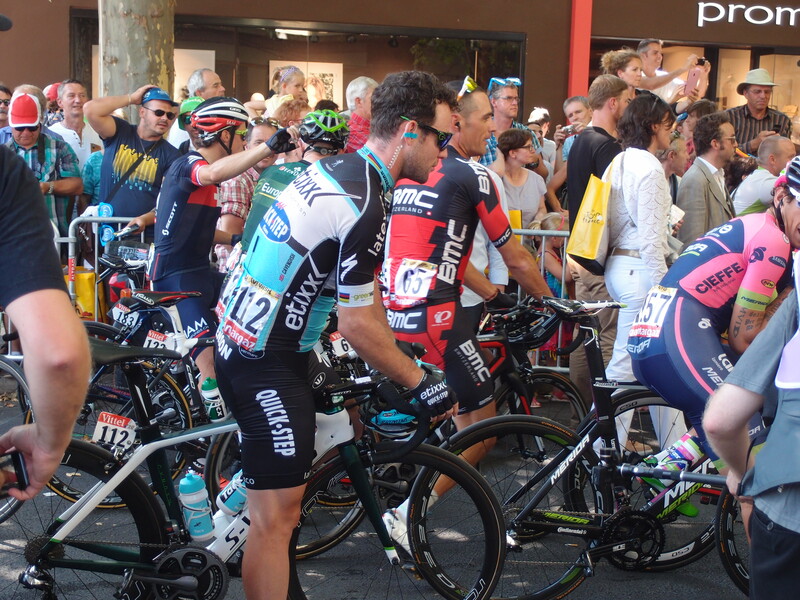 Mark Cavendish of ETIXX Quickstep waiting with riders for the stage to start in Digne. 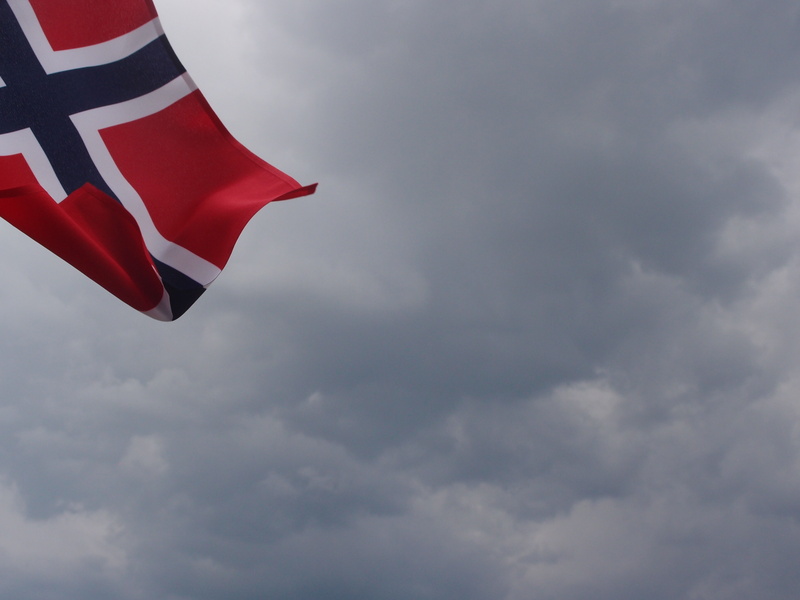 The Norwegian flag flies high over the course. Chris Froome races around the corner in chase of the breakaway. The remains of the peloton chase the leaders up the mountain towards the finish line. A note here about driving: some days it is easy to follow other cars that are clearly heading to the same finish line, cars filled with tour merchandise, maps and cameras and other times, you’re the only one on the road (thinking you’re going the wrong way). On this day, we followed all of the team busses and cars to the base of the mountain where they would collect the riders at the end of the stage. As the thunderstorm rolled in – literally drenching us from head to toe (white pants:good in theory) – we were desperate to descend the mountain. It was an unpleasant experience with mud, hail and bikes everywhere. Fortunately, the road at Pra Loup goes nowhere and is too narrow for the team busses to climb and collect the riders, so they too must ride down the mountain. Weaving between the spectators of thousands with languages from all over the world, the screams of “get out of the way” are the professional riders trying to prevent injury by zoomed passed us. Star struck the crowd yells notes of encouragement to the likes of Niballi, Porte and Rogers. Sadly, no sign of Froome and Contador; something tells me there is room for their busses at the top of the mountain. 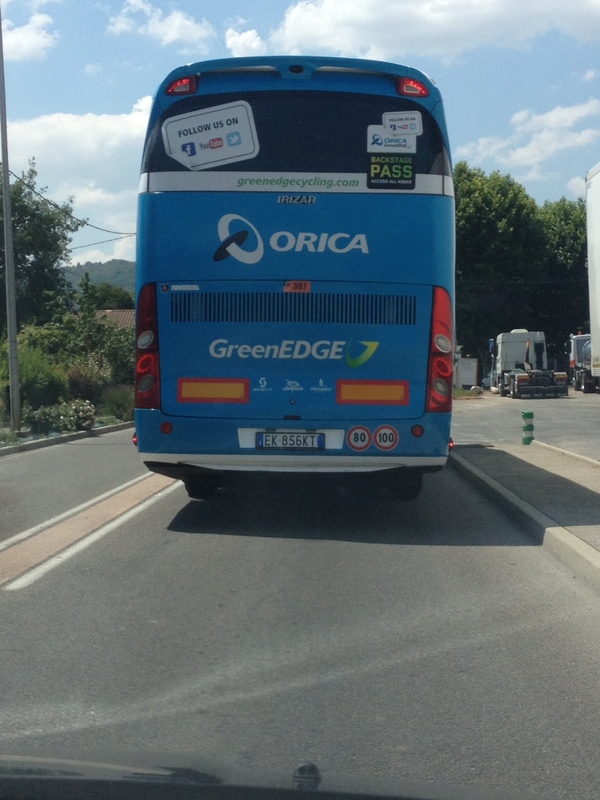 We tailed the Orica GreenEDGE bus most of the way between the start and finish of the stage along with the SKY, Tinkoff and Cannondale busses. Stay tuned for the epic mountain stages featuring sulking riders, mice, monumental sunrises and sunsets plus more shenanigans from the caravan.